Over the last couple of weeks, we took a look at some common and easy bluffs including “stealing the stealer”, “the squeeze play”, “taking advantage of a dry flop”, more common bluffing concepts, and the semi-bluff. 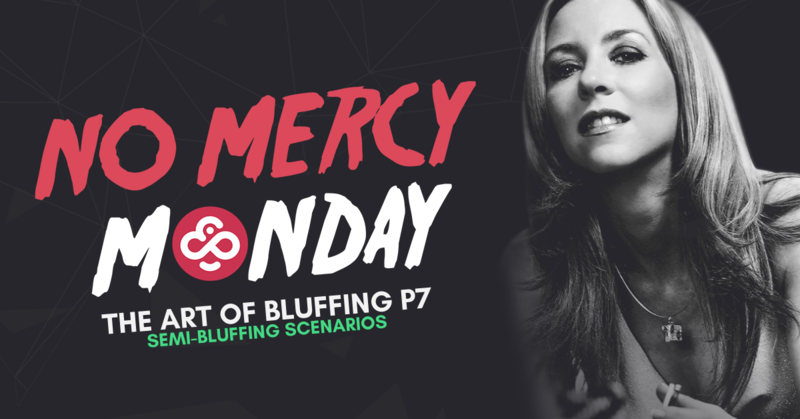 This week we’ll be diving deeper into the semi-bluff by sharing two of the most common scenarios where this bluffing tactic is used. To help you understand semi-bluff theory, we’ll take a closer look at the scenarios where semi-bluff opportunities tend to present themselves. This scenario happens when you hold a huge drawing hand like a flush draw combined with an open-ended straight draw (i.e. if you hold Q-J of diamonds and the flop comes 5-9-10 with 2 diamonds). In this case, you can realistically hope to win the hand with any diamonds (9 outs), and any 8 or K (8 outs, but two of those outs are already included within the diamonds’ outs), so it’s a total of 15 outs. This actually places you as a favorite with close to 60% chances of winning the hand and therefore is an excellent opportunity to semi-bluff aggressively right there to try to win the pot. That being said, if the turn card is NOT one of your outs, you will be down to only 30% chances of hitting one of your cards on the river. We will study all the calculations and mathematics of the game in the next chapter, but remember that when you have a big draw, it’s definitely a good time to semi-bluff. Now, this scenario presents itself when you hold a drawing hand with two overcards (i.e. you hold K-Q of spades and the flop comes 2-3-7 with two spades). In a case like this, you can genuinely hope to win the hand by hitting any spades (9 outs), but you may also be able to win the pot if you hit one of your overcards to the flop, a Queen or a King. This again gives you 15 outs and places you as a favorite. Unless, of course, your opponent holds a hand like pocket Aces. Remember that every player will be blessed with this premium hand from time to time, or more precisely once every 221 hands. But you cannot fear these situations and expect your opponents to hold these types of premium hands every time they call your bets or raises. We will continue analyzing these scenarios next week, and take a deeper look at the advantages of the semi-bluff play. Don’t forget to join me twice a week in the Hubble Bubble tournaments to practice your skills and try to win my 5000 CHP bounty!